Saturday, April 21st, 2012 was a big day. About 300 people turned up in Choteau Montana to tell Congressman Dennis Rehberg how they felt about the Rocky Mountain Front Heritage Act. Many of those folks were right along the Front, and a bunch came from other towns. All in all, Congressman Dennis Rehberg got an earful. Especially from hunters and anglers. Mike Menke of the Montana Chapter of the Wild Sheep Foundation, Greg Munther from Backcoutnry Hunters and Anglers, Chris Marchion from Anaconda Sportsmen, Helena Hunters and Anglers, Montana Wildlife Federation, and on and on all testified in support of the Heritage Act. It was a thing of beauty. The Camo Coalition that comes together in support of the Front continues to grow. Saturday was evidence to that. 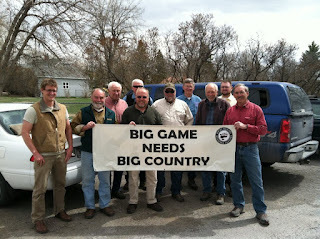 Hunters and anglers are repeating history. Just as they did with Cecil Garland and the Scapegoat Wilderness, sportsmen and women showed up in the communities closest to the proposed legislation and were counted in favor of conserving Montana’s Crown Jewel, the Rocky Mountain Front. The testimony for the Heritage Act was overwhelming. 40 to 14. The crowd wore blue “Made in Montana” stickers to show their support, and I even saw a few of the opponents dipping into the Coalition to Protect the Rocky Mountain Front’s cooler of pop and juice (and string cheese). Congressman Dennis Rehberg got an earful. What he does with that knowledge, and the understanding the Montanan’s want the Front protected, should help guide his decision. The Rocky Mountain Front has a history of Conservation going back to 1913 when the Legislature passed the act that created the Sun River Game Preserve. There is a place on the Front where I hunt. It is wild; full of wolves and bears and elk and deer. It’s like no place else on earth. It deserves to be seen as it is by others, 100 years from now. It’s time to honor the deal, and pass the act.